This change backports changes from the upstream ICU 62.1 maintenance branch into the Chromium copy of ICU, in order to enable the "placeholder era" for the upcoming new Japanese Era. With this change you can set/define an Environment Variable named ICU_ENABLE_TENTATIVE_ERA to true which will enable the placeholder era name. Also included in this change are some minor changes to the scripts used by Chromium for building the data files so that they actually work on Ubuntu. CC: @alexeykuzmin (also FYI for @aandrejs). 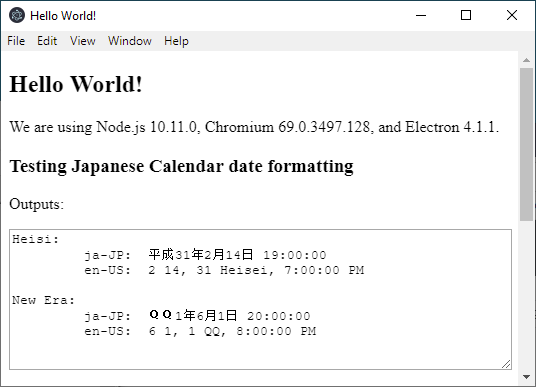 (Note the use of "ＱＱ" instead of the "平成" for the date format for ja-JP). // Heisi Era will end on April 30, 2019 so pick a date before. // New Era starts on May 1, 2019. Notes: Added support for testing the new Japanese Era with a placeholder era name. Set an environment variable named ICU_ENABLE_TENTATIVE_ERA to true to enable the placeholder era. "placeholder era" for the upcoming new Japanese Era. for the placeholder era name. Just to clarify, where the ICU data files generated following the instructions in https://cs.chromium.org/chromium/src/third_party/icu/README.chromium ? I regenerated all of the checked-in data files (for Android, iOS, ChromeCast, etc.) even though I think Electron only uses the "common" one. Is that something we should care about when updating icu with patches ? I'm not sure I understand the question? Perhaps you could rephrase it?. Yes, Chromium makes a number of "Chromium-specific" changes to both the ICU code and the ICU data files. If you are just patching things in ICU (by pulling things from upstream ICU) then you generally/hopefully will not have any issues with conflicting Chromium-specific changes. However, if you try to independently bump the ICU version in Electron, then yes -- you will also need to carry forward all of the Chromium-specific changes, which might need to be changed between ICU versions. This is just the placeholder era name. You have clarified it, thanks! 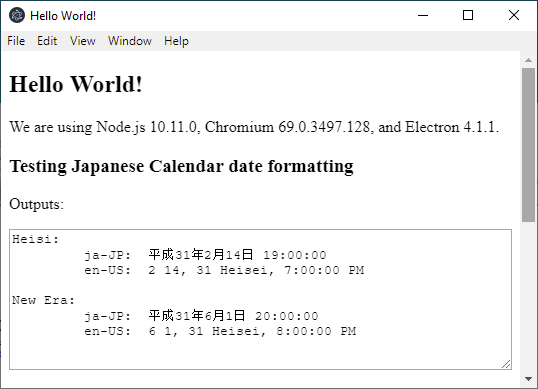 Added support for testing the new Japanese Era with a placeholder era name. Set an environment variable named ICU_ENABLE_TENTATIVE_ERA to true to enable the placeholder era.